Real street fights are serious trouble – the kind of trouble that most martial arts don't prepare you for. So what do you do when a street thug approaches, wanting to make you his next victim? Former security professional and hapkido black belt Alain Burrese has the answer. In this explosive two-disc set, Burrese teaches you how to blend the proven hand techniques of boxing and hapkido's devastating throws and kicks into a streetfighting system that is sure to keep you on top and put your opponent on the pavement. Burrese begins by teaching you the "tools of the trade" – including killer punches, hammerfists, palm heels, elbows, knees, kicks and throws. Then, through chillingly realistic scenarios and slow motion photography, he shows you how to apply these tools against the kinds of punches, grabs, weapon attacks and gang attacks you'll really encounter on the street. 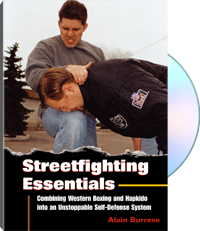 Streetfighting Essentials is a comprehensive self-defense system that bridges the gap between martial arts theory and streetfighting reality. Don't settle for anything less. For information purposes only. Alain Burrese is a veteran U.S. Army sniper who learned the art of hapkido while stationed in South Korea. In addition to his formal martial arts study, he has worked extensively as a bouncer, bodyguard and security specialist and has an exceptional understanding of the difference between fighting theory and reality.